A week or so before our travel to Thangpalkot earlier this month, Kumar Sir told me about a little girl, Sabina, and a small boy, Saugat, whose guardian and family, respectively, were struggling to cover the children’s educational expenses. Hearing their stories, I decided I would pay these children a visit during our visit to the village. Sabina, a beautiful little girl studying in second grade, I discovered, does live with her maternal aunt just as Kumar Sir had described. Her dad had died a while ago. Though her mom was still alive, she had remarried and left the village with her new husband. (I didn’t ask for details beyond that.) But they weren’t the only problems the little girl faced. For a while now, it turned out, she had displayed considerable insecurity about her background and had begun using and writing a different surname from the real one. The little 3rd grade boy Saugat’s dad, unfortunately, had been in the bus that drove off the road and plummeted down a hill last summer killing 14 on the spot. While the dad was lucky to have escaped with his life, he had injured his legs–he is lame as result. His mom is a day labourer. The boy and his family live with his paternal aunt and her husband, unable to support themselves completely. As per my request, the Principal of Taltuleswory, Ms. Pandey, submitted a formal request for sponsorship. They are very detailed as you can see below. 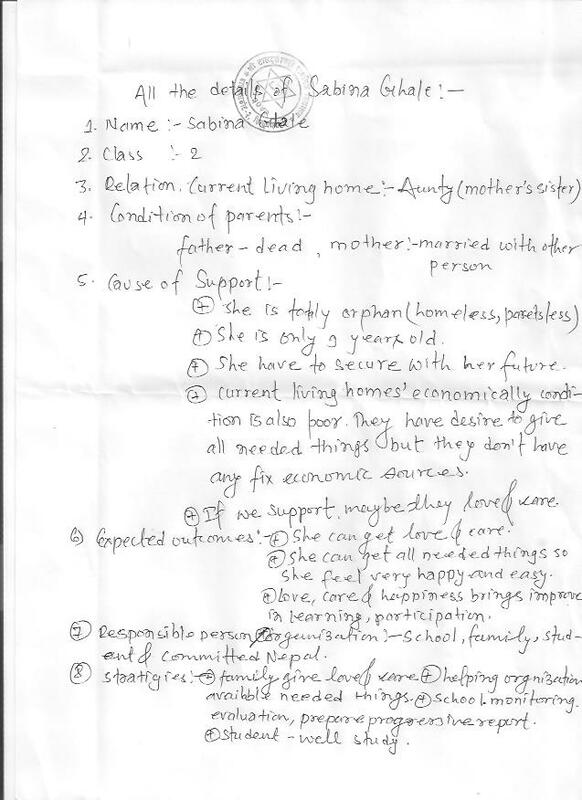 Request for Sabina and Saugat’s sponsorship. 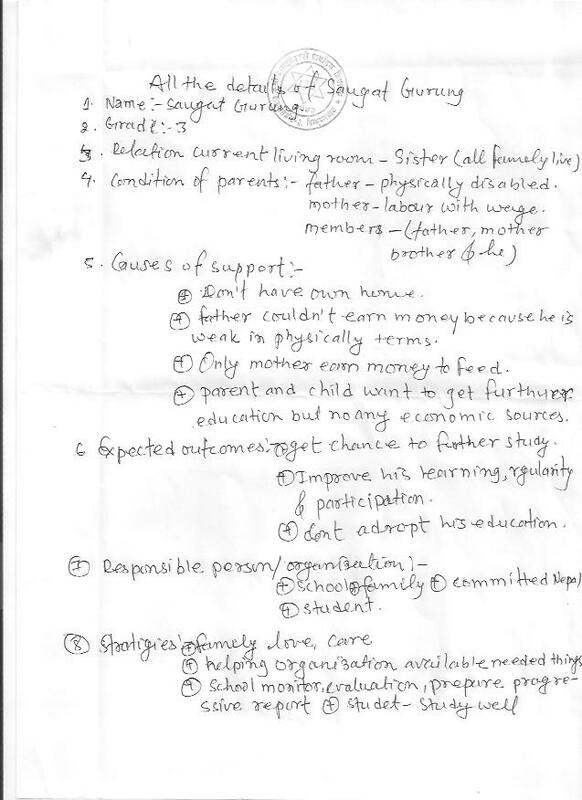 Sabina Ghale’s story in the Principal’s words. Saugat Gurung’s story in the Principal’s words. 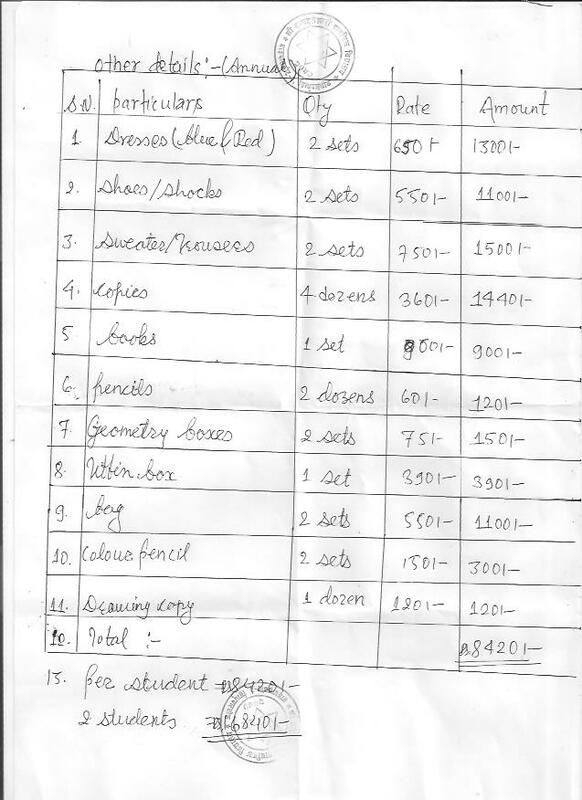 Currently, the education of one student costs Rs. 8420 per year. (At the current rate of exchange, that amounts to about US$87.00.) See below for a complete breakdown of the expenses. I am thrilled to report that a friend, who wishes to remain anonymous, has agreed to sponsor Sabina’s education all the way through to 10th grade! Now, Saugat needs a sponsor! Please let me know by email or by some other means if you are willing to sponsor him. If you are contemplating doing so, please have a read of our sponsorship policy and how it works before you make your final decision. And be sure to visit this page later for updates. Another friend, who also wishes to remain anonymous, has agreed to sponsor Saugat!!! Thank you you two–you know who you are! Both Sabina and Saugat passed their exams and are now in grades 3 and 4 respectively. It’s been almost two years since the last update. There have been some changes to their educational situation. We supported both Sabina and Saugat’s studies in 4th and 5th grades (academic year 2015-16)(2072) at Taltuleshwori School as well. But, following the earthquake of April 25, 2015, feeling a little awkward sending out request for the funds, I never did. After that however, the school found a better sponsor for Sabina and Saugat moved to a different village, following which we have stopped supporting the two students.